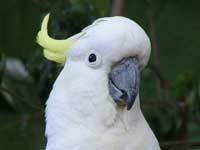 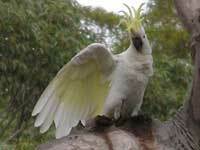 The Sulphur-crested Cockatoo is best known for its very loud raucous screeching. 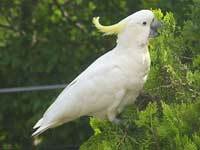 They are usually found in flocks of a dozen or more. 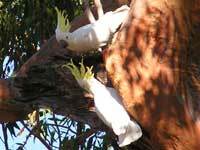 The pair to the right are perched in a Sydney Red Gum - Angophora costata. 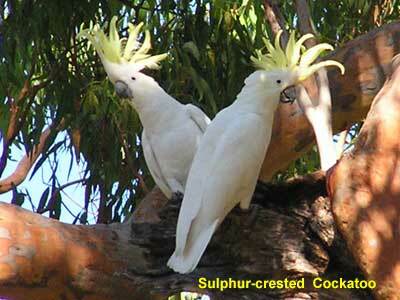 Sulphur‑crested Cockatoos can be found throughout the eastern states, Tasmania and across the "top-end" of Australia. 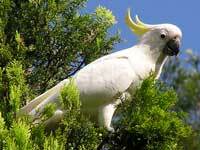 These photos were taken in Cheltenham in Sydney, the Lane Cove National Park and at Austinmer on the New South Wales South Coast.